It’s probably no surprise that nursery ideas and design is taking up too much space in my brain at the moment. All the major elements of my little baby’s room are taking shape or on order. I’m now in the pretty styling and accents stage and it’s not as straightforward as you would think. The reason, well I believe that vintage, antique and family keepsakes bring soul to a room and this includes all the rooms in my house. Finding things isn’t as straight forward as popping to IKEA – which btw has some wonderfully affordable baby/toddler/kid pieces. So I’m snooping and hunting. My own loft has given me a few things of consideration in a repurposing way, as has my parents and the in-laws lofts. But those last remaining pieces are illusive. Etsy though has been keeping me busy in the evenings. I find it eminently more shoppable than ebay and I love the handmade section, but it’s the vintage selection that’s generally been my hunting ground. Below is a trawl through some really wonderful yellow items that are on etsy and made it on to my I-really-really-like-that list. 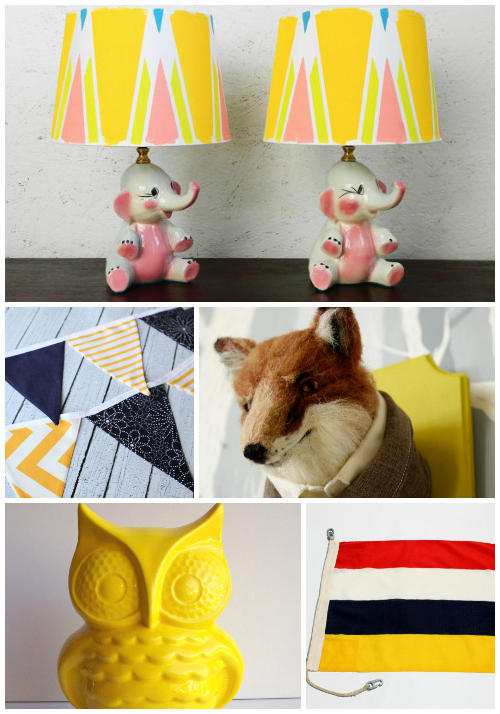 I adore those elephant lamps too! And the fox! It must sooo exciting decorating a nursery. Are you having a boy or do you not know? @Peagreen98 I think we're kindred design spirits.. love the Edith & Eleanor lights you found, keep posting!